overall body strength, as well as endurance! But kids would never know; the giggle and squeals that flow freely make it seem to be all just fun and games… ENJOY! The American Heart Association and Center for Disease Control both recommend 60 minutes of moderate to vigorous physical activity in youth. Only about ¼ of America’s youth meet this recommendation, and the physical, emotional, and social consequences are devastating. Help us SAVE THE WORLD, ONE RECESS AT A TIME! 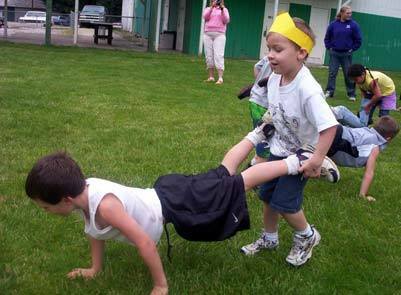 Bring Recess & Results entertaining exercise to the children you serve! Get paid to play! Recess & Results Youth Movement Instructors earn income running a R&R business in their community. We provide R&R instructors all the training and resources needed to market and teach R&R programs at schools, daycare centers, family fitness facilities, recreation centers, parks, churches, at birthday parties and more! 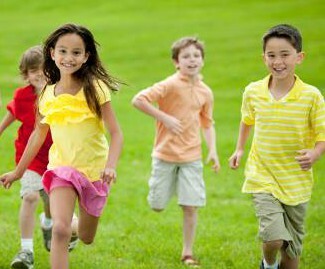 Rejoice at Recess uses "play" to build Godly character, Godly confidence, and Godly friendships in today's youth. Rejoice Instructors lead youth through activities and games, incorporating biblical teachings that establish a healthy body, mind, and spirit in recess participants. RR is something that needs to be in every community. Very few school districts offer the recommended physical fitness guidelines within their curriculum and unfortunately physical education is the first thing cut from schools. Recess and results offers additional opportunities for children to meet and exceed their physical fitness needs while building social skills, self-esteem, friendships and so much more!